Conference calls are essential to most small businesses. Small business owners have always needed to communicate with associates, partners and their internal team on a given business day. In the digital age, we are seeing people find new ways to connect with their coworkers and business associates. An example of this is just this month, one of the players in the free conference call space just launched a new screen sharing option for telephone calls. Slack, one of the players in the free conference call game has just launched this screen sharing option so team members can now speak over a conference call while also working on documents. We are citing this early on because free conference calls are evolving every day with new technology being built and ideas that once may have not seemed possible becoming integrated into the every day business life. There are several business conference call services that we will compare. Of course, AT&T, Verizon, Optimum, Timewarner and the behemoths of the technology industry still offer conference calling services, but the truth is that they are offered at a much more expensive rate than the rates of the newer entrants into the conference call service industry who are offering the ability to make conference calls for free. VoIP, or Voice over IP, also known as IP telephony, refers toand voice communications and multimedia sessions that take place over Internet Protocol networks. VoIP phones are now available on smartphones, personal computers, and over the Internet. Most of these companies drive an income by routing non-toll-free calls around the country through exchanges that are used less than others and the website, or VoIP then charges a fee to the exchange provider. We will now go over some of the most used VoIP services in the industry and discuss the positives and negative of what each have to offer. FreeConferenceCall.com is a brilliand domain name because they created a company, named it and bought the domain name for exactly what they do. They allow their users to create calls that can host up to 1,000 people then their software provides statistics in their account dashboard. This website boasts 250 million annual users from 800,000 businesses. Free video recording, screen sharing and up to five simultaneous video feeds are offered by FreeConferenceCall.com. Addiitionally, they have recently become available in India and include free international conferencing. The program is compatible with Outlook and Google Calendar so you never miss a call. Playback is another interesting feature they offer that makes it easy for you to record your call, share it with your coworkers, or someone who may have missed the call and playback the meeting at a later date. A transcription is generated from the calls that allows you to search for keywords or from an automatic transcription of your meeting. For an additional fee, you can search and sort the transcript by topic. The remote desktop option allows you to control, support and collaborate on someone else’s computer on the call during the call. You can also see who is speaking or mute and dismiss callers. Integration is possible with Slack. There is custom hold music and a unique phone number that requires no PIN. Invitations go out via e-mail. Their only integration is available through Slack, the messaging service. UberConference is another highly regarded phone service that prides itself on the fact that they call you and there is no PIN provided. They offer Free and Business Plans. The free plan allows access to mobile apps, has HD quality audio, call recording, screen and document sharing, the access to unlimited conferences with up to 10 partisipants and allows for Phone and VoIP audio. Their business service could be beneficial for small business owners who are usuing conference callers regularly, don’t want any advertising when they call (like the free plan); this service also provides you with analytics, allows you to have calls with up to 100 participants instead of only 10 on the free version. Custom call-in numbers are provided to US and Canada users. This also allows for a team management portal and to dial out to add guests to a call. Weekly sales slides are shareable through UberConference and you can edit the final copy after actually going over the slides with your coworkers during the call. You can call from your phone or the Internet. Integration is available on social media platforms, like Google+, Twitter, Salesforce and LinkedIn allowing users on the call to pull up information on the callers. Google Drive and DropBox allow you to open and share documents on the call. Skype is the company cited with paving the way into this generation of VoIP calling. They are pioneers of this industry because they are noted as second-generation providers and one of the first ompanies to have built closed networks for private based users. Skype is a great option and they offer free video calls, voice calls and free instant messaging. You can easily create a video call for up to 25 people. Skype comes with Office 365 and offers 60 minuts per month to call more than 60 destinations around the world. As they’ve grown over time, only the first month is free, but allows for unlimited mobile calls in 8 countries and landlines in 63. Calls can be made from mobile, table, laptop or TV and there is no commitment you need to make so this could be good if your small business needs to make international calls for a month. 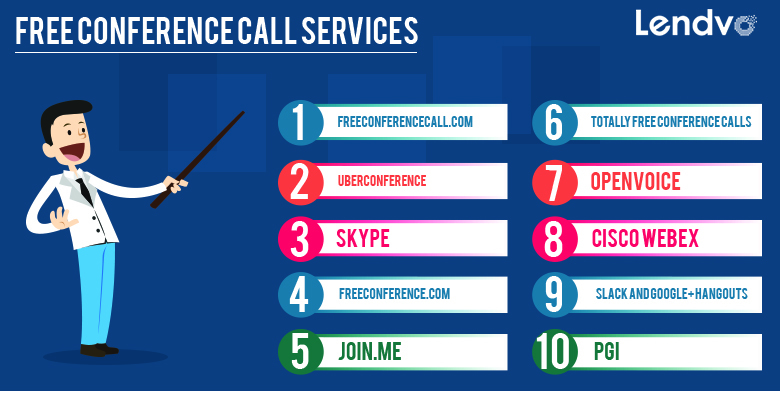 FreeConference.com is another free telephone conference call service that offers free conference calls, video conferencing, screensharing, toll-free dial-ins and mobile apps. There are no fees, surcharges or downloads required to use this service. You simply will get a dial-in number and access code which will allow you to use Free Conference Call as needed for whatever meeting you may need to have. Your free account allows for you to have a virtual online meeting room with up to 400 audio participants and you can actually have unlimited conferences. It is compatible with mobile apps like the Android and iPhone. Live support is available and the conferencing can be done instantly without scheduling the conference beforehand. Yet, if you would like to schedule your meeting ahead of time you can do so with automated invitations and remindors. Call summaries will be provided to you when the call is completed. Document sharing is available instantly on your call. SMS notifications are also availabe to notify you when your call is beginning. Join.Me offers unlimited audio conferencing and is a great solution for ways to host online meetings for whatever you may need to have one fore. Anyone can call into the join.me confernce number with their personalized 9-digit code. Mute is available through the simple service. The service provides integration with OpenVoice which is discussed bewlow. The scheduler on join.me allows you to coordinate with Google Calendar, send invitations and begin your call. The service is compatiple with iPhones, iPads and Androids so you can conduct your meeting and business while on the road. Join.Me is also compatible with Slack allowing its users to benefit form conversing with each other on a Share Screen while also being able to message via text to one another. Join.me is also available for integration with SalesForce which allows you to start an online meeting from your SalesForce email account and use the powerful media features of join.me like the unlimited audio conferencing and recording. They offer 24/7 service to discuss recording a meeting, updating the program or any other troubleshooting questions you may have. Join.Me also offers the white canvas option allowing users to draw, or write and interact with one another to create renderings or thought cycles of their business cycle. Totally Free Conference Calls is another company with a brilliant domain name like FreeConferenceCall.com. They are not as big, but still have a large user base and a lot going for them as a business. They have over 250,000 users who they claim are ‘happy’ and over 9,720,000 free calls made each year. There are no reservations or time limits with Totally Free Conference Calls. You can hold the conference whenever you would like for as long or short of a time period as you need. Their digital lines offer better conference quality and they allow for one dial in number and one conference ID. ScreenMeet is the intermediary website used by Totally Free Conference Calls that allows you to share your screen with your fellow callers. You can reach more viewers with this link and there is nothing you need to download to use this. There is no up-front cost for the trial, but then the mobile plan costs $12.50 per month, desktop $20 per month for their lowest plans. The all-inclusive plans for mobile are $125 and $200 for desktop. Some of the features may make it worth it for your business, but this definitely makes it feel more difficult to stomach than using UberConference or FreeConferenceCall.com. An interesting and unique service they do offer is calling your clients and agents as a value add; they will build a website with customized logo, colors and branding for you. OpenVoice is another reputable free conference calling telephone service that has a state of the art phone service allowing for anytime access of up to 500 callers. Additionally their technology provides integration with the Outlook calendar allowing you to schedule calls with other members via Outlook. Their service allows you to join a meeting via GoToMeeting or start a phone call with a tap that is free for the iPhone and Android. Their global access feature provides toll and toll-free numbers for attendees in over 50 countries. They offer free voice recording which is hard to come by as there are more services requiring payment. Their partnership with GoToMeeting also allows access to GoToWebinar and GoToTraining so OpenVoice allows for a toll-free call in with no codes or PINs for a webinar or traning session whether it is a college class or coding academy. It is only one-tap to join a confersation and they allow for fast scheduling and inviting of people to attend. They also provide email notifications to let other attendees know if you are running late for the call. The App additionally tells you exactly how many minutes to your call. They also allow you to create specifical call groups and statistic reports making the process easy for you. Cisco WebEx is an example of the larger companies mentioned above like AT&T, Verizon, Optimum, TimeWarner that used to control the conference call market. It is imperative that they now make a push into the conference call market and they are doing so with a new interface as part of their website that offers them new customers a free trial and boasts HD video and impressive audio. The free trial lasts for 30 days and includes Cisco Spark. Cisco Spark prides itself on creating productive team workspaces with new tools and by providing messaging and file sharing for its customers. The interface the developers have build with Cisco Spark allows files or designs or renderings, for say an advertising, architecture or event firm, to exist within the conversation your team is having. Additionally if you are already in a team messaging, or texting conversaion, the files live in here and if you need to discuss your mission on the phone it takes only one tap to do so. This room is created by giving you a unique URL so you can chat, edit and work with your team. The HD interface will cost you more than the companies that do offer free services though beginning at $19/month per user for 8 people, $29 per user for up to 25 people and $39/ month for up to 200 people. As mentioned above, Slack recently partnered with Google Hangouts to launch a free (for those teams invited) service utilizing the Slack technology in combination with the share screen technology. The interesting thing about their free service (non-Google related) is it allows for 5 GB storage, two-factor authentification, 10 apps or services to be integrated and searchable messages up to 10,000 from recent team conversations. Google + Hangouts has been one of the fastesy ways to run your free conference call. Their service is usable on every device allowing you to make live-stream conference calls, organize contacts. Of course, since this is Google and Slack, both with state-of-the-art technology it is essential to keep an eye on the progress of this new venture and see if they do in fact stay free; they could be right for you and your team. PGi is another top player in the videoconferencing landscape. They offer an all-in-one audio conferencing service that they have created with GlobalMeet. This is an award-winning service that prides itself on its enhance audio communication and the fact that they can host up to 300 participants. Their interface provides audio access via PSTN and VoIP. PGI additionally has a partnership with Skype known as Skype for Business that allows you to make global conference calls. The integration is seamless within the Skype interfact and it allows you to connect with over 160 access numbers in more than 60 countries. Mobile is a breeze and prices are flexible. Their features allow you to collaborate with other participants on the call with the share screen feature and you can upload files while recording your presentation to share with those who could not attend the call itself. Plans for GlobalMeet start at 19 cents to $12 per user each month for the best package. The latter allows for unlimited web and audio access, international toll free add-ons and the inclusion of the Agenday app. PGi offers extensive feature for small business users and has won awards like the 2014 Silver Edison Award for Company of the Year, the 2013 TAG Technology Association of Georgia award, the 2012 Silver Stevie Award for most innovative technology company of the year and 250 innovators of the year by InformationWeek. At the end of the day, it is up to you to decide which free conference calling option is right for you and your small business. With new companies merging daily with great technology, the telephone conference call industry continues to be at the forefront of how meetings will be conducted for a long time which is why we mentioned the latest with Slack. Additionally paid options like Pgi may be right for your business at the end of they day. UberConference feels like the best option after reviewing all the free conference call options while FreeConferenceCalls.com, FreeConference.com and Join.Me are all legitimate options.